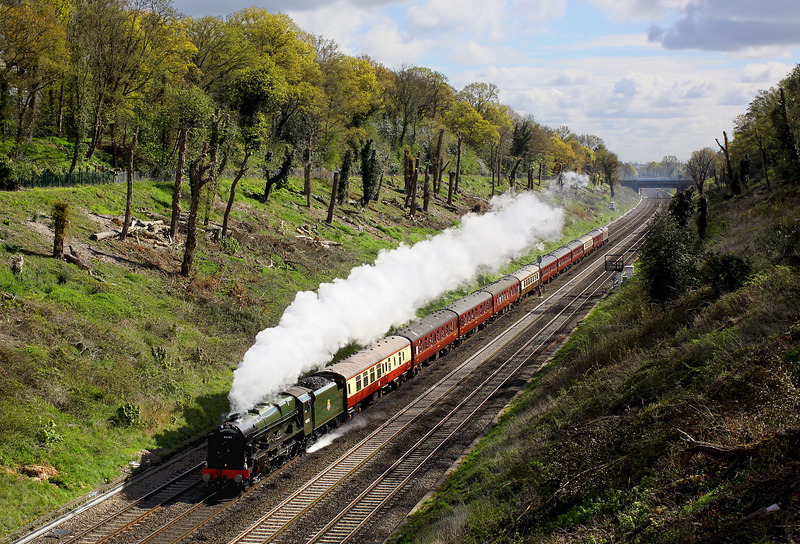 Royal Scot Class 4-6-0 46100 Royal Scot passes through Sonning cutting on 26 April 2016 with the Railway Touring Company 1Z82 08:44 Victoria to Plymouth 'Great Britain IX' railtour. This was day one of a mammoth nine day tour of the whole country. The train was booked to be hauled by 46100 & 44871, but the 'Black Five' had failed. Strangely, this is the first time in nearly 40 years of railway photography that I have seen either of the two preserved Royal Scots! This picture was extremely lucky on two counts. The sun had only just reappeared from behind a very large cloud, and the fine exhaust seen here had only just recommenced, after a minor shut off by the bridge in the background. 57316 can just be seen on the rear of the train.